By Bin Li and Ma Sha, Eppendorf Inc. 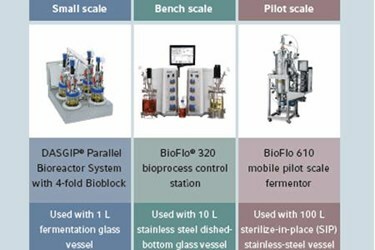 The scale-up of fermentation processes is critical to the success of industrial fermentation for the production of biologicals in the biopharmaceutical market. Eppendorf bioprocess systems are available with autoclavable, single-use and sterilize-in-place vessels and together cover a wide range of working volumes from less than 1 L to as large as 2,400 L. In this application note, we used E. coli fermentation to demonstrate the scale-up capabilities of Eppendorf fermentation systems from small scale to bench scale and pilot scale. To determine suitable parameters and setpoints for the operation of each fermentor, we considered critical scalability-related engineering parameters. The parameters described include proportional vessel/ impeller geometry, oxygen transfer rate (OTR), impeller power numbers (Np) and impeller power consumption per volume (P/V).